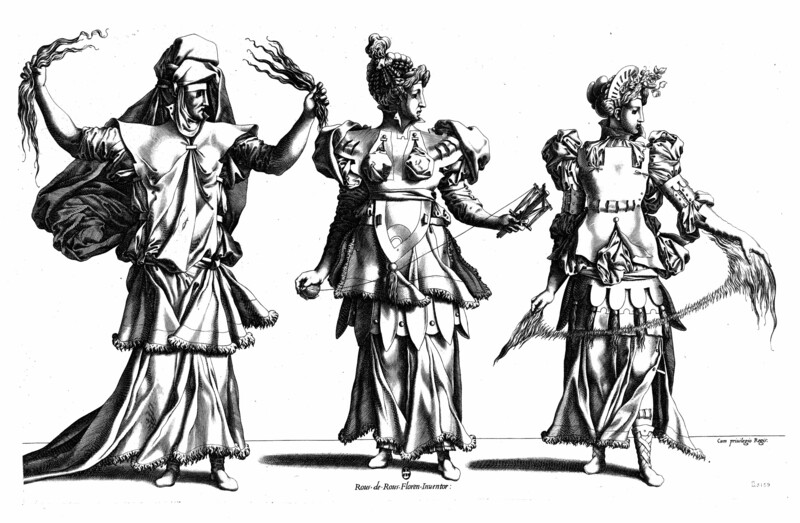 There are four costume designs that can certainly be attributed to Rosso, those of the Three Fates, of around 1534, known from an engraving by Pierre Milan (Fig.E.104), which may be the “parche” mentioned by Vasari, and another of Hercules, recorded in an anonymous etching (Fig.E.160), which could have been designed for the festivities that accompanied Charles V’s visit to Fontainebleau at the very end of 1539 (Carroll, 1987, 31, 212-216, nos. 69-70, with Figs. and 342-344, no. 107, with Fig.). But there must surely have been other such designs by the king’s most important artist for the festivities in Paris and Fontainebleau, and perhaps elsewhere, that were part of the important occasions of Francis I’s reign. Although there are recorded payments to those who actually made costumes and masks in 1533, 1537, and 1538, there are no documents that mention Rosso as the designer of them.1 But the records of payments to Rosso almost never specify his activities. Dan, 1642, 218, states that when Charles V arrived at Fontainebleau on 24 December 1539 there were to greet him in the forest “une troupe de personnes déguisées en forme de Dieux, et de Deesses boccageres” and then goes on to say that their rustic dancing “ne fut pas moins agreable en la bigearre façon dont ils estoient revestus,…” No indication is given by Dan, or by anyone else, of who designed these costumes. Vasari mentions that half of the “ornamenti” made for this visit were designed by Rosso, and the other half by Primaticcio (see under L.48). But he makes no reference to who designed the costumes, unless “ornamenti” includes masks and costumes. However, it is possible that Rosso designed those that Dan describes. 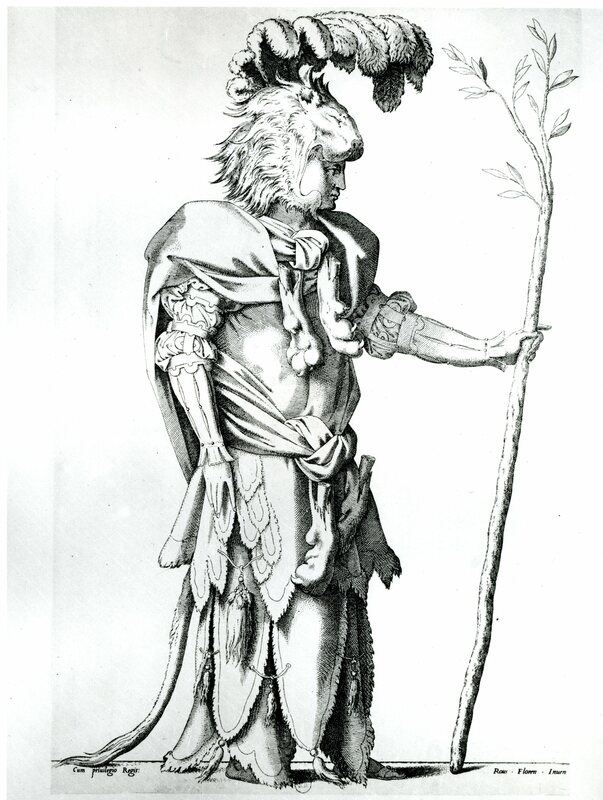 The Hercules costume referred to above could have been one of them, or it could have been designed for some other event performed at the time of this visit. 1 On the prints of various masks in profile that have been incorrectly attributed to Rosso, see RE.13. There are also two full costume designs that have been wrongly thought to be his inventions (RD.26, and RE.12). But these derivations from his art bear witness to a knowledge of his kind of costume designs from more examples than have been so far identified. For the documents see Laborde, II, 1880, 214, 234, 237-238, 242-243. The first of these of 1533 (modern style) refers to “quatre habillemens de masques d’escarlate rouge et violette” and to payment made at the end of the preceding year, but the occasion for which the costumes were made is not indicated. The second payment of 15 September 1537 (mentioned by Champion, 1935, 119) is “pour façons d’habillemens de masque” apparently for the festivities connected to the marriage of Francis I’s daughter Madeleine to James V, King of Scotland, on 1 January 1537. One payment of 1538 is for “deux accoustremens de masques que le dit Seigneur [Francis I] a faiz faire pour servir au festin des noces de Monseigneur de Nevers;” the other is for “acoustremens de masques … tant au jour de la feste des nopces de Monseigneur de Longueville que pour le tourncy fait après la solempnité desd. nopces,…” The lengthy account of 1539 (modern style) is for “deux acoustremens de masques” but the festivity for which they were made is not named. For some of these various costumes Rosso might well have supplied the designs. But so, however, might Primaticcio, as well as others (see McAllister Johnson, in EdF, 1972, 27, in regard to a reference of 1534 to Nicolas Belin da Modena as a “sculpteur et faiseur de masques”).